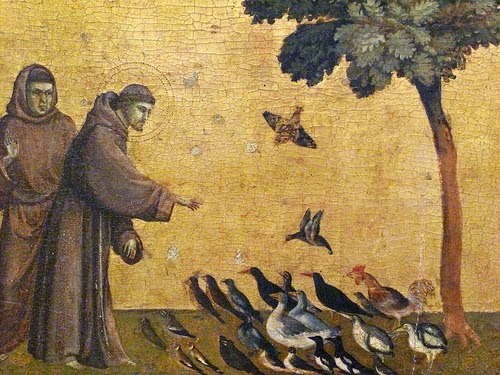 St Francis (AD1181/2 – 1226) is the patron saint of animals and ecology. He saw nature as a mirror of God. In this sense he differed from most religious medieval thought. Many saints are connected with animals in some way, for example St Eustace (the stag) and St Melangell (the hare). The ability to tame or speak to wild animals is a sign of divine or supernatural power in most cultures and mythologies; Harry Potter speaking to snakes being a recent example. 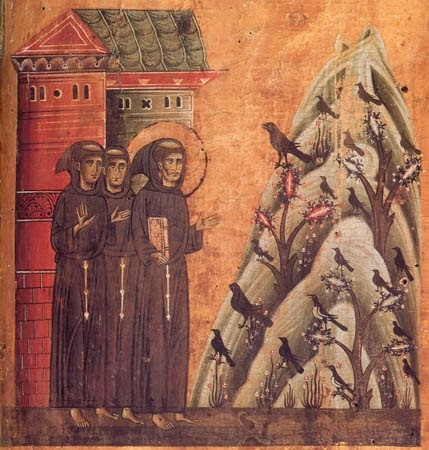 But St Francis was unique in considering animals as his equals, calling them brother and sister, and ascribing understanding to them and the ability to have a relationship with God. One of the most famous stories about him tells that when he was travelling and saw a tree full of birds, he began to preach to them. The birds came down from the tree and gathered around him to listen. This became a popular motif in Medieval art, as it showed St Francis’s humility as well as his special divine power and wisdom. But I am interested in this story for a slightly different reason. According to the Little Flowers of St Francis (based on 13th century sources but only found in 15th century manuscripts), the saint’s sermon exhorted the birds to praise God because of all the ways God looks after them, giving them good clothing, places to drink, eat and rest. 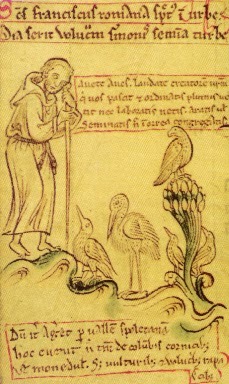 St Francis cautioned the birds against the sin of ingratitude. In essence, he spoke to them as if they were human. Can an animal be grateful? Can an animal be ungrateful? It is an interesting thought that in ascribing to animals the status of brother and sister, St Francis also ascribed to them the sins of humanity. If an animal (most often cats, in my experience!) behaves ungratefully or takes things for granted, we usually ascribed this to its nature not to some moral or spiritual failing. Although we still look for human characteristics in animals. It is hard to view this video without feeling that the chimpanzee had some sense of thankfulness (especially with the emotional music in the background), although it probably also needed reassurance in a strange environment. We seek human patterns of behaviour in animals, longing for understanding, trust and connection. The work of domestication has allowed us to share our lives with animals, without becoming their prey. Having domestic animals has certainly added to our understanding of animal behaviour, but these fundamental questions persist: How close are we? How far apart? It seems to me that the more we anthropomorphise animals, (those little outfits for dogs are one particularly irksome example) the less we allow them to be wild, with their own adapted behaviour in their own wild habitats. Understanding animals was never more important than now, when so many of them are disappearing into the human wasteland our kind has created.